Last week we started a series of posts in which we are re-examining well-known passages of Scripture. 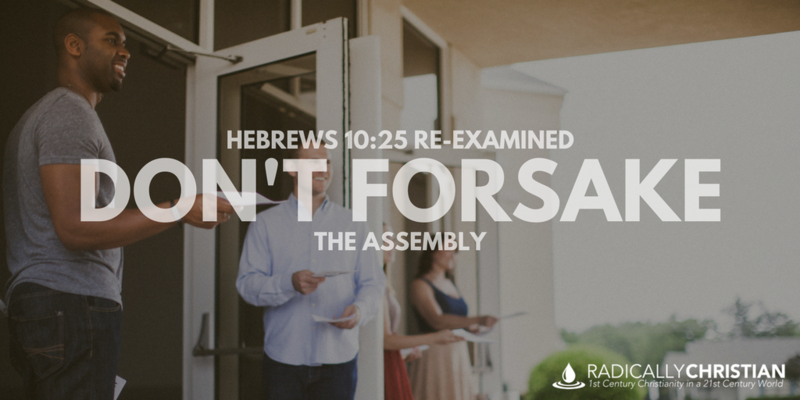 This week we will look at Hebrews 10:25, “not forsaking the assembling of ourselves together, as is the manner of some…” (NKJV). This passage is often cited to rebuke those who “miss church,” but is that really what the writer of Hebrews had in mind? This passage is often used to compel church attendance. 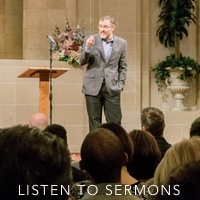 We are told that missing a Sunday or Wednesday service – without an adequate excuse – is “forsaking the assembly.” But is that what the writer of Hebrews meant? Did he really just mean, “Don’t skip church services”? The book of Hebrews was written to a group of Christians who had “endured a hard struggle with sufferings” (Hebrews 10:32). They were “exposed to reproach and affliction” (Hebrews 10:33). They witnessed their brothers and sisters being thrown into prison. They themselves “joyfully accepted the plundering of [their] property” (Hebrews 10:34). It sounds like to me this letter was written to Christians who experienced the “great persecution against the church in Jerusalem” (Acts 8:1). Back then, these Jewish Christians endured this persecution with joy and faith. But now, decades later, their joy and faith seem to be wavering. Some of them are ready to abandon the way of Jesus. The book of Hebrews is written to prevent that falling away. It is written to show that our covenant with Jesus is better than the old covenant. Jesus is a better high priest, who entered a better tabernacle, to offer a better sacrifice, and give to His people a better inheritance. To abandon Jesus would be the worst mistake anyone could ever make. Hebrews 10 is all about the fact that without Jesus, there is no forgiveness of sins. Jesus was the one single sacrifice for “all people” for “all time” (Hebrews 10:10-14). Therefore, if a person rejects the sacrifice Jesus made on their behalf, there remains no other way for them to be saved. The writer is encouraging them to “hold fast…without wavering” (vs. 23). He is warning them not to “trample under foot the Son of God” or “profane the blood of the covenant by which they were sanctified” (vs. 29). He warns them not to “throw away their confidence” (vs. 35) or to be like those who “shrink back and are destroyed” (vs. 39). Jesus cried out, “My God, my God, why have you forsaken me?” (Matthew 27:46; Mark 15:34). God did not “abandon” Jesus in the realm of the dead (Acts 2:27, 31). Paul said they were “persecuted, but not forsaken” (2 Corinthians 4:9). Several of Paul’s companions, including Demas, “deserted” him (2 Timothy 4:10, 16). God promised, “I will never leave you nor forsake you” (Hebrews 13:5). As you can see, the word “forsake” carries with it the idea of “abandon” or “desert.” And that makes perfect sense in the context of being told, abandoning Jesus would be the worst mistake anyone could make. It seems that some of the Christians in that congregation had already made it their manner of life to abandon, turn their back on, and desert the church. The Hebrew writer is telling them to grow closer together. He is telling them to figure out ways to rekindle the desire in each other to love and do good works. He is telling them to encourage each other more and more, so that no one walks away from Christ. He is telling them not to turn their backs on the church and on the church’s togetherness. Does this passage mean the church should meet together, gather together, assemble together? Absolutely. That’s what it means to be the “church.” It means we are a group of people who have been gathered together by Jesus and we make it our custom to gather together regularly to encourage each other and stir each other up to be loving and do good works. Think about it this way: I have a lot of work to do at the office today and I will probably have to miss dinner with my family this evening. It is disappointing, but it does not mean I have made it my custom to “abandon eating with my family.” There are certainly some men who have abandoned, forsaken, or deserted their family togetherness, but occasionally missing dinner does not qualify. In fact, it would be downright cruel to accuse a husband and father of abandoning his family in a situation like this. Similarly, it seems a vast exaggeration to accuse someone of “abandoning” congregational meetings because they were not present one week. Does this mean it’s ok for church togetherness to not be a priority in our lives? Absolutely not. Being together with our church family should be of utmost importance to us. And perhaps the more we focus on making our meetings a place where people are encouraged and stirred up to love and do good works, the more people will desire to come together.